"Whether as a strength builder, a cardio workout, or a rehabilitation device, I give the HeartFlex high marks for versatility. At $39.95, it is affordable too. The neat thing is that the HeartFlex can be used standing, sitting, walking, or lying down, working out on a treadmill or stair climber, or even watching TV. Depending on how and where you move the grips, it can isolate any upper body muscle group. The resistance is actually light, but consistent and over time, it will prove valuable to either a fragile senior citizen or a conditioned athlete. This ingenious twistable bar with grips on either end is a terrific piece of equipment where light resistance and multiple repetitions are desired. That makes the HeartFlex a perfect way to warm up for golf or tennis or any activity for that matter. Like swimming, this sophisticated little machine produces "consistent resistance" through motion in any direction, critical to building strong, dense muscle tissue. 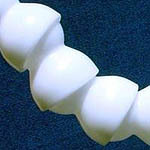 This is made possible by 18 precision ball-and-socket joints, not springs or rubber bands." I have just ordered my 3rd Heartflex. I love this thing! I've been using mine for about 6 years now; and am replacing my 2nd one. These really work! I will be 61 later this month and I feel great. Thanks so much for this product! I have been using the Heart Flex for at least 3 years. I have maintained weight and importantly toning. Your Heart Flex device has truly inspired my continued running and exercise routine...I ran 100 miles last month ...not bad. Whether I am running or doing an inside workout the Heartflex is part of my daily routine. Heart Flex is definitely easy to use ...and also motivating as I do my daily workout! "You can feel the burn instantly. It has made a huge difference in my forearm and wrist strength. It is so small and convenient I take it in my car and can use it anywhere, while I'm working or watching TV. I would recommend it to anyone. " ""The HeartFlex device is portable and easy to use, and would make a smart addition to any golfer's pre-play warm-up and overall conditioning routine." "Mo' is hitting the ball straighter and farther than ever before, since combining the HeartFlex with a heavy club on a daily basis. On a recent trip back from Cincinnati, Mo' did hundreds of reps with the HeartFlex and boy, is he ready to play! Not only is it not a toy, I haven't put it down for three days. It is tremendous. The DVD, which I watched first as per your instructions, was very helpful. The HeartFlex device is one of the most efficient cardio and forearm exercise implements that Mo' Golf has ever encountered." "I can't tell you all the HeartFlex does because I'm constantly finding new ways to use it. I am over 60 and had developed sagging pecs. I am almost back to my look of 30, at least in body." "I think the HeartFlex is great - it has helped me so much giving me more strength to use my wheelchair with less arm and shoulder pain. Just purchased a second one as a gift for my brother so he can prepare for the Cricket season here in England." "The HeartFlex Upper Body exercise tool is an excellent warm up tool for golfers. It creates a continuous, light resistance throughout a range of motion. The tool takes your upper body through a number of exercises and motion, which are necessary for a smooth golf swing. Made out of space age plastics and using recent breakthroughs in modern molding technology, the HeartFlex uses 18 precision ball-and-socket joints to create the consistent resistance. No jerky or abrupt motions are noted. It is a wonderful warm up tool as well as training tool for golfers. 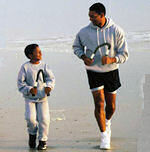 It can be used sitting or standing, and does not require complicated routines to be memorized. It is simple, easy to use, very effective, lightweight and affordable. A highly recommended tool!" "We think your slogan should be: "Looks are deceiving" since Deb, who works with me didn't think much of the product until she used it and now she's a convert to it. It's great!" — From Dr. Kimberley Williams article entitled "HeartFlex and the Golfer"
"Aside from swing mechanics, a great deal of attention is now being focused on fitness levels of golfers. HeartFlex can be used when walking, jogging, standing, sitting and even lying down. Take it to the office, hotel, or anywhere you want a great workout. Need to warm up before your next round of golf? HeartFlex will do the job. At approximately $40, this product is useful to the golfer and non-golfer alike." "This has been great for my hands, wrists and arms. And the cardio effect is incredible. I love making people try mine out for just 12-20 seconds. It really surprises everyone. Your product is the most amazing exercise tool I have ever seen. I am a lifelong golfer who has played over 45 years. Throughout my schooling and beyond I have played and competed in at least five organized sports. I wish I would have had the Heartflex 40 years ago. I have two now, one in my home gym and one in my travel bag which is great for when I am on the road. It folds up so well I take it every where with me. I have now bought the Heartflex for my family and close friends as Christmas presents for them to remember." Hi, my name is Justin. I'm 14 years old. I really want to improve and become a better athlete so one day I can play at a good college. Please could you help me? Pitching and playing short stop. Do you have any feedback yet? I've been using it everyday and I really like it. I didn't see any huge body changes (like bigger biceps and chest) but I did definitely see changes in my grip strength. I also got more flexible. I know because the stretches with the HeartFlex that were hard for me are now much easier. I do it everyday as part of my warm-up and also at night. My forearm and wrist always feels really warmed up and ready before I play. I haven't felt any pain or soreness in my arm at all. Usually I feel a bit sore after pitching or long tossing. The soreness was always in the lower and inner elbow. I haven't felt that pain for a long time now. I could definitely tell you my pitching and hitting grip and flexibility improved. I feel that my arms got much stronger although its mass didn't increase much. "As both a videographer and video editor, the Heartflex has proved to be a terrific exercising device for me. It's made my arms and forearm stronger which has really improved my hand held shooting. And as an editor sitting behind a desk all day, it lets me get in workouts while my computer renders complex sequences - no more just staring at the screen. Light, sturdy and at a great price, I highly recommend the Heartflex." "My classes love the addition of the HeartFlex! I am using them at an assisted living facility where the population is less conditioned than the Silver Sneakers." I love the HeartFlex! When I first started I could only move it for 1/8 th mile of my usual mile and a half walk. Now I'm up to moving it for 3/4 of a mile and can really feel the difference. 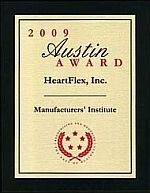 The HeartFlex is a unique resistance device that works the muscles of the arms and torso. 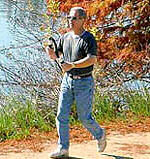 It is fun to use while walking or jogging but can be used sitting down. Several other BCRC staff members are now trying it out and I've found it is best for me to work with it every other day when I'm doing my fitness walk. After just a week, I can already feel a big difference in muscle tone." "I like it, its fun to play with. It gives you something to do with your hands. I've never enjoyed exercise, but this is fun!" Alice, who walks 1 1/2 miles per day, said about using HeartFlex, "This is fun! This keeps your mind off things. I would use it in my apartment every day. It arrived yesterday. At first look I wasn't real positive, but after doing some of the exercises I have changed my mind. I am also letting someone from work try it while they do their walk around the complex. I'm waiting for their comments." "The comments I got from my co-worker were very interesting. She typically walks around the complex once or twice a day. I would say she is in the best shape and she is active and walks at a quick pace. She eagerly wanted to try the HeartFlex after I showed it to her." Yesterday in Chicago, our temperature was getting close to 80 degrees. She came back after her walk red faced and looked a bit tired. She said she could only do one of the exercises for about half of her walk. For her it was too much. "I see this as very good thing. It points out to me that while you might not think there is much effort required to do the exercises for a period of time, you had better think again. I am not after a short term gain, but would rather do the exercises over a larger amount of time to get the long term benefit." "Using HeartFlex has strengthened my wrists and forearms which allows me to go on longer motorcycle rides! I keep it on the couch and use it while I'm watching TV." "I wanted to let you know that my brother-in-law’s father loves using the Heartflex. I just spoke with him and he said he uses it for his exercises every morning." "I am ordering my 2nd HeartFlex device. These are great! Very easy to use and a great variety of exercises for the upper body. Also, just the right amount of resistance. It seems easy at first, but will definitely give you a workout. Thanks for a great product!" "I am an occupational therapist from New Jersey, working in an inpatient rehabilitation facility. I stopped by your booth at the AOTA convention in Houston back in April. I purchased your incredible HeartFlex tool and have loved its uses for not only my patients, but for older family members as well. "